Hang our with your favorite "mini" celebrity on this 2-hour private photo tour of Las Vegas. Stop at iconic Sin City photo sites such as New York New York, Paris and the Welcome to Las Vegas Sign. As you ride in style along the Las Vegas Strip, your professional photographer will be snapping away, capturing photos of your group (up to 35 passengers) along with mini Elvis, Prince or Michael Jackson. Hotel pickup and drop-off and transportation by party bus is included. Your 2-hour photo tour will begin with hotel pickup from your Las Vegas Strip hotel by party bus. You and your group (up to 35 passengers total) will be greeted by a professional photographer and "mini” entertainer of choice. While cruising along Las Vegas Boulevard, enjoy your mobile party while being entertained by your celebrity impersonator. Your professional photographer will be documenting the fun on the bus. You'll make stops at iconic locations such the Bellagio Fountains, NYNY and the Welcome to Las Vegas sign where you will have more photos captured with your group and entertainer. 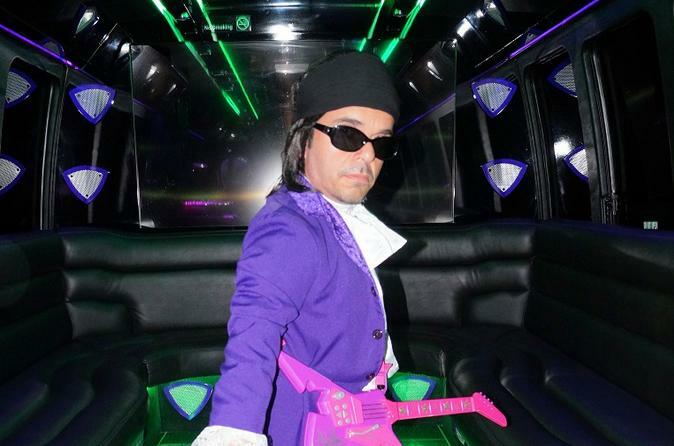 Celebrity impersonators include Elvis, Yoda, Prince, Michael Jackson and many more. Please advise of your preferred option in the Special Requirements field at the time booking. Please note: the pricing displayed is for up to 35 passengers.